Holidays are for escaping and that is just what you'll do at Pebble Beach Retreat. 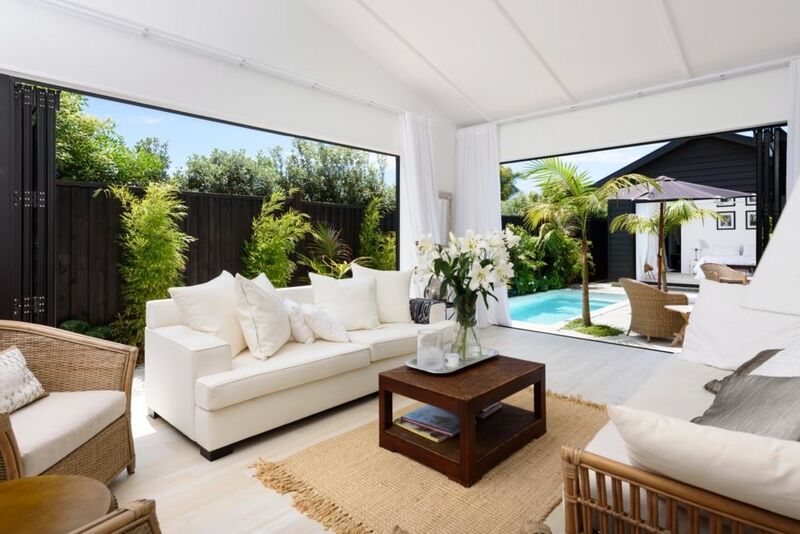 Surrounded by tropical gardens and beautiful interior design and decor gives this home a serene and tranquil feel. Sliding doors off each room bring the outside in connecting you with the pool area . Every detail has been carefully thought out in this home so that your holiday experience is one that you will remember with pleasure. Beautiful decor and furnishings throughout offer a relaxed and sophisticated atmosphere. Each bedroom and bathroom has it's own outdoor area with a view of the lush tropical gardens, with the master bedroom also opening up onto the pool area. The kitchen is the center of the home and comprises of an additional butlers pantry. The surf beach , cafes and shops are a short stroll away. Time in a Place holiday property management endeavor to make your stay in the beautiful Bay of Plenty enjoyable. We invite you to come and enjoy our fantastic beaches, cafes and restaurants and am happy to offer advice on the great activities we have available. You will find that all of our properties are clean and well provisioned for your holiday needs. Time in a Place takes the hassle away from holiday home owners by offering holiday home management which includes preparing homes for short term letting , managing of bookings and servicing properties between stays. The property is fantastic and has everything there you would ever need for your stay. It is immaculately presented as per the photos you see online. A very memorable stay. The house is presented to a very high standard. The mix of indoor / outdoor living with pool and privacy made for a great holiday. Highly recommended. This property is divine! It is so well appointed, spacious, clean and secluded. This property is divine! It is so well appointed, spacious, clean and secluded. We absolutely loved our time at Pebble Retreat - it is a credit to the owner. Our Property Manager D'arne couldn't do enough for us and was so lovely to deal with. We would go again in a heartbeat. We couldn't recommend it more highly for peace and tranquility when you just need to relax and have time out. Thank you Megan for your lovely review. We are so glad you enjoyed your stay.